In addition to being a pageant queen, brand ambassador, runway, and internationally published model and cover model, Ivy is also Fashion Editor at Unique Blend Magazine and co-owner of The Discerning Gentleman which is an online store for imported top quality men’s fashions at affordable prices. Ivy is also a published award-winning nurse and nurse mentor with who is currently in school furthering her education in the nursing profession. When not working, Ivy enjoys many varied hobbies and interests including the arts, riding her motorcycle and being involved in many charity and philanthropy events and causes such as Shriners Hospital, Children’s Hospital, various military charities and causes,anti human trafficking, domestic abuse, sexual abuse, women empowerment, animal rescue, and cancer research. Victoria Sagrera, 65th Louisiana Cattle Festival Queen 2014 Louisiana Association of Fairs and Festivals Queen of Queens 2017 Miss Louisiana United States Model- Karishma Creations, Atlanta Market (2015, 2016) Model- Karishma Creations, Dallas Market (2015) Model- Angela and Alison and Terani Couture, Dallas Market (2016) Selected as Jovani IT girl (2015) but could not participate due to college graduation Competing for the title of Miss United States 2017 on July 8 in Orlando, Florida! Hannah Uhlig competed in her first pageant at age 12 while living in Virginia. She became an international model at age 15, working in Tokyo, Japan and has modeled for MacDuggal, Pageantry & Prom Time Magazines, and more. Not only has Hannah spent years in the beauty industry, she remains committed to her education. She currently attends UT Houston’s McGovern Medical School and is a MD/MPH candidate. Achievements: MAAI’s Female Model/Talent Award in NYC (2010). 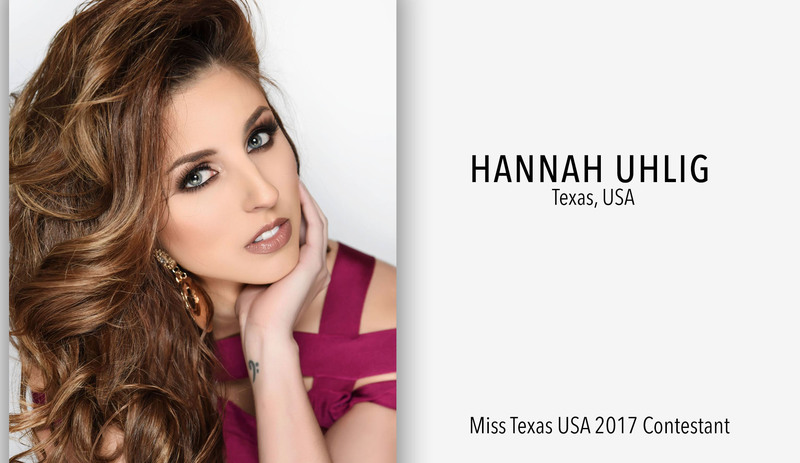 2nd runner up Miss Houston USA 2017. Miss Central Texas 2016 (MAO). Top 8 & Miss Photogenic at Miss Texas 2016 (MAO). 3rd runner up Miss Austin USA 2015. 2nd runner up Miss Virginia USA 2016. 2nd runner up Miss Teen Virginia USA (2010). 2nd runner up Miss Virginia United States (2013). 2nd runner up Miss Teen Virginia United States (2011). Miss Albemarle 2008. With a decade of experience in high fashion editorial, runway, athletic, bridal, commercial, and swimsuit, Rachel Stacy is a force to be reckoned with. She has modeled nationally and internationally for Sherri Hill, Mac Duggal, Vera Wang, Lilly Pulitzer, Marlene H’ Couture, and Nike to name a few. 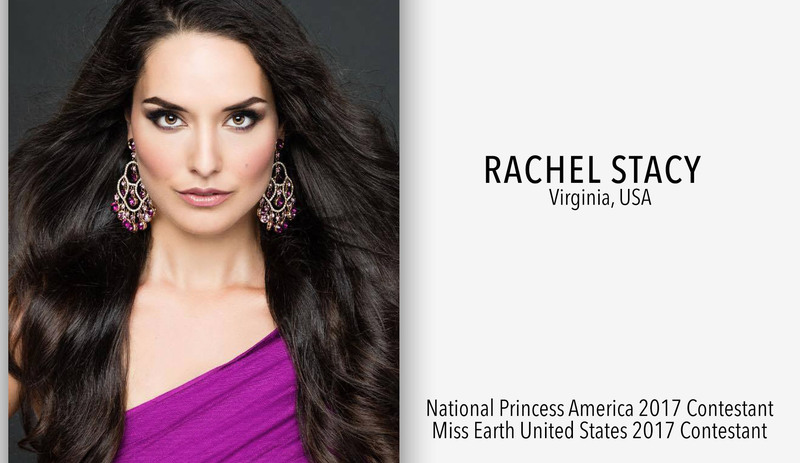 Rachel is the current reigning Virginia Miss Princess America 2017 and Miss Tennessee Earth United States 2017. Courtney Little is 18 years old and resides in Hickory N.C. She is currently Miss Teen North Carolina United States. She is a senior and maintains a 4.0 GPA and as a member of the National Technical Honor Society and the National Society of High School Scholars. She was varsity cheerleader and is on a competitive dance team. Courtney enjoys volunteering for many organizations but especially the Leukemia and Lymphoma Society. Courtney, plays Anna from the movie Frozen. She, along with her sister who plays Elsa, volunteer at several children's hospitals. In her spare time, Courtney enjoys spending time boating on Lake Hickory with her family. She loves traveling to new, exciting destinations and exploring different cultures. Courtney is excited about continuing to serve her community during her rein as Miss Teen North Carolina United States. 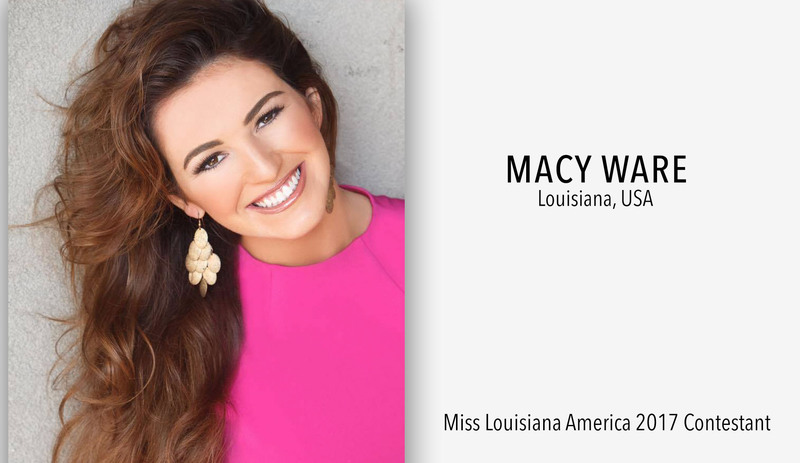 Macy Ware is a 20 year old from Buchanan, Virginia. She now resides in Baton Rouge, Louisiana. Macy is a Junior at Louisiana State University where she studies Interior Design and Dance. Macy has been involved in the Miss America System for 9 years. She will be competing in Miss Louisiana at the end of June in Monroe, Louisiana. Macy is heavily involved in community service and volunteering with The Children's Miracle Network, American Cancer Society and Susan G Komen Breast Cancer Foundation. You can also catch Macy dancing or golfing in her spare time. Jane Gagne is a mother, wife, model, business owner and pageant coach from Calgary, Alberta. She is currently the reigning Mrs Canada Earth 2017, and will be competing at the Mrs Earth pageant in Las Vegas this June. Jane is the owner of Valley Entertainment, one of Canada's top Brand Ambassador agencies, employing over 150 staff for the last 10 years. She is also a choreographer and trainer for the Miss Teenage Canada and Miss World Canada organizations. She also has worked as a model for over 20 years. 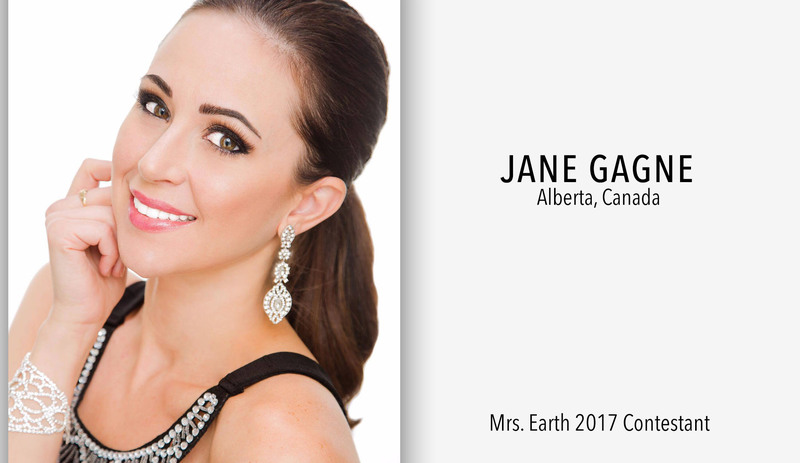 Jane has had the honour of representing canada in 9 international pageants, most notably placing top 5 at Mrs World 2016 and winning the title of Mrs World fitness. In her spare time Jane enjoys attending her kids sporting events, travelling and baking. She is a volunteer with KidSport Canada. Hello! 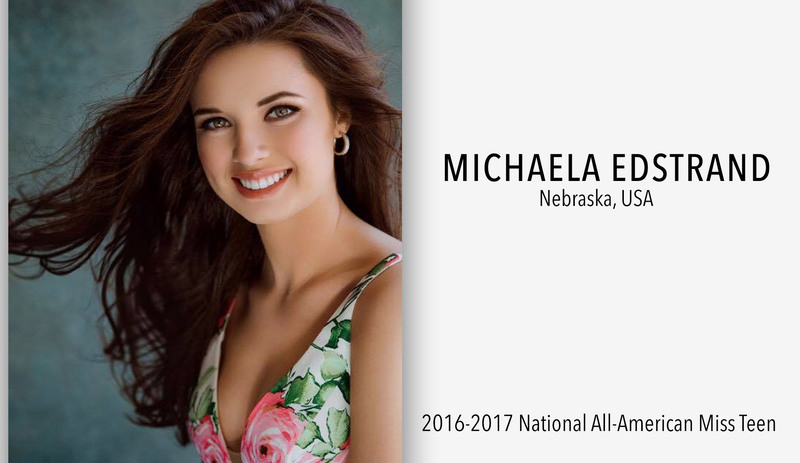 I'm Michaela Edstrand your 2016-2017 National All-American Miss Teen for National American Miss! I'm a junior in high school at Skutt here in Omaha, Nebraska my hometown! At Skutt I am currently on the tennis team, speech team, student council, FBLA, and operation others. I volunteer with HETRA, Munroe Meyer, Ollie Webb, Special Olympics, Smart Girl Style, UNMC, Madonna School, Fit Girl, and Smart Girl Style! Volunteering has become one of my biggest passions yet and has led me to meet so many new people as well as through Miss Amazing. Miss Amazing is a pageant for special needs girls. I am currently a national ambassador for the Miss Amazing pageant and the Miss Nebraska Amazing asst. director. I have been honored to receive the Volunteer Service award through Skutt, a Nebraska state wide essay semi finalist award, and the National President's Volunteer Service award. . I have held the titles of Miss Photogenic NAM Nebraska, Miss Personality NAM Nebraska, and Miss Omaha for National American Miss. I began pageants when I was 13 years old. Pageants have shaped me into who I am today and have helped me meet some of my best friends! I have not only grown in confidence, but as a person as well. I have gained life long skills I will always use and it has helped me to embrace the person I am through my passions. I'm a entrepreneur from Scotland, the Founder of Star Tanning UK. The Star Tanning brand was previous Sponsors for Miss Galaxy UK, Miss International UK, Miss Intercontinental UK and Miss Teen GB. We currently sponsor Miss Europe and Miss Great Britain along with the UK's biggest Empowering Swimsuit competition, Miss Swimsuit UK. After being hand selected by designers in Madeira Fashion Weekend to model their collections on the catwalk, I have gained belief and confidence in myself and found my self esteem again. Miss Swimsuit UK stands for Be Confident, Be Fun, Be You and I have decided to compete in the Glasgow heat.